I love a good traybake. 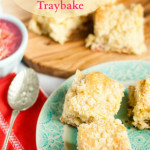 Easy to make – simply mix, bake, cut into squares and eat. No need to fiddle around decorating. Simply cake – focussing on the flavour and texture. With Spring in full swing the first rhubarb is now in season (and coming down in price) so it is the perfect time to buy some and enjoy. I’ve paired it with orange – a classic combination and topped my traybake with a crunchy strusel to add texture and interest in absence of decoration. In a twist on most cakes this one is egg free – handy if you have run out and perfect for catering the growing number of people with egg allergies – and made with Flora Original Spread. If you try this Recipe: Rhubarb & Orange Tray Bake with a Strusel Topping please tag #FussFreeFlavours on Instagram or Twitter. It is amazing for me when for me when you make one of my recipes and I really do love to see them. You can also share it on my Facebook page. Please pin this recipe to Pinterest too! Thanks for reading Fuss Free Flavours! 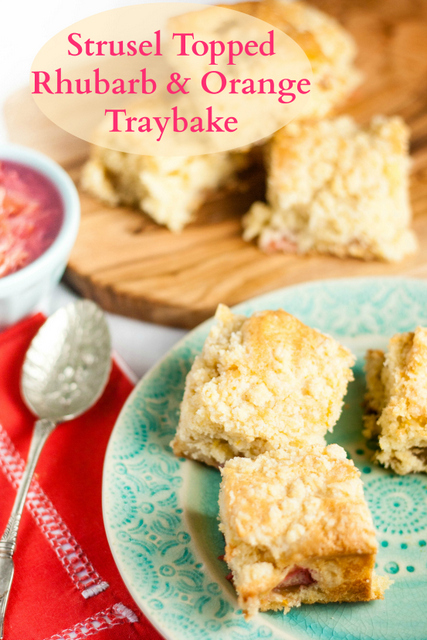 A crunchy Strusel topped rhubarb and orange tray bake, ideal for celebrating the flavour of seasonal rhubarb. Egg free and easily adaptable to be gluten free. Line a 15 x 25cm (6 x 10?) baking tray or oven dish with parchment paper and oil with a drop of vegetable oil. Preheat the oven to 180C / GM4. Using an electric mixer beat the Flora Original and sugar at high speed until they are pale, light and fluffy. Gradually mix in the milk, flour, baking powder and salt at a lower speed. Using a spatula fold in the orange zest and the rhubarb. The batter will be quite stuff. Spread the batter into your prepared cake tin. Put all the ingredients for the struesel topping into bowl and using your finger tips run the Flora into the dry ingredients until it is the texture of breadcrumbs. Scatter over the cake batter and press in gently. Bake in the preheated oven for 35 – 40 minutes until the cake has risen, is golden and is springy to the touch. Allow to cool before removing from the tin and cutting into squares.